The Audio sheel consist of two parts, top shell and bottom shell. Top shell made by aluminum 6061-t6,after cnc machined in one block, polished the surface to be shinny, then anodized depends on the color sample which was provided by client. After discussed internal, the bottom shell better to use sheet metal staming process not cnc vowin.cn/en/News/news1251.html' target='_blank'>machining, the aluminum 5052 is the best choice. 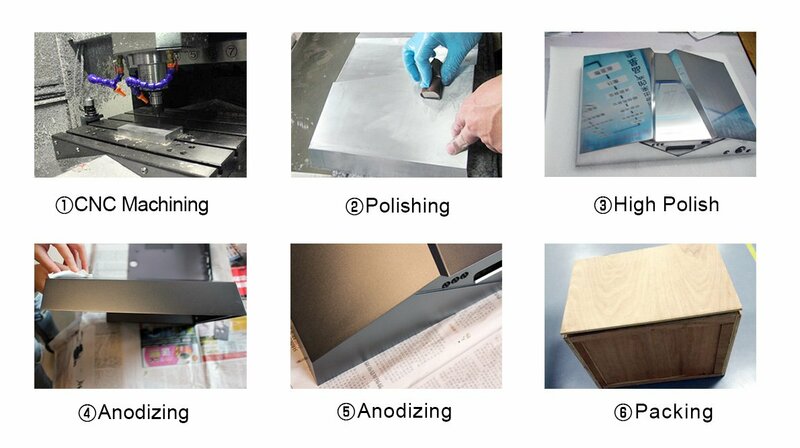 after sheet metal stamped, polished the surface to be shinny,then anodized depends on the color sample together with top shell. Because the top shell and bottom shell should be assembled to one set, so the holes need to be tapped after anodize to make sure the holes with no anodize layer and can be assembled well. In order to achieve the client's require with no dust no dot and best touch feel on surface, we packed carefully with wooden box.